Toyoda Gosei Co., Ltd. has developed a turbo duct made entirely of plastic. This reduces weight by half and will contribute to the environmental performance of automobiles. 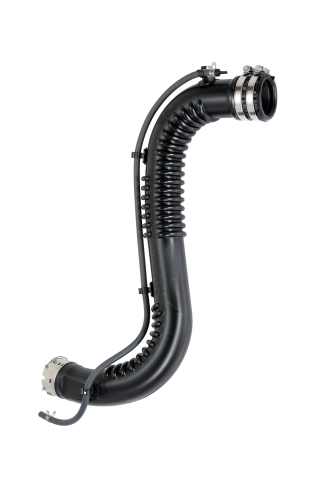 The new lightweight plastic turbo duct is used on the new HiAce for international markets that Toyota Motor Corporation launched in February 2019. * Blow molding is a process in which a hollow center is formed by blowing air into plastic that has been poured into a mold. It is used for everyday items such as plastic bottles. Suction blow molding is a technique that combines blow molding and suction. Plastic poured into a mold from above is suctioned from the bottom and after it has diffused throughout the long cavity air is blown in to form the hollow center.